Thousands blog for peace. This is what they had to say. What will YOU say? 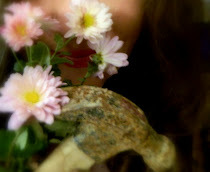 Dona Nobis Pacem in the blogosphere. What is it? 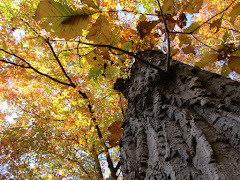 A small group of bloggers answered a challenge I tossed one angst-filled October day in 2006. It seemed to me at that moment that the whole world lay in turmoil. No peace to be found. I had to do something. Have you ever felt that way? 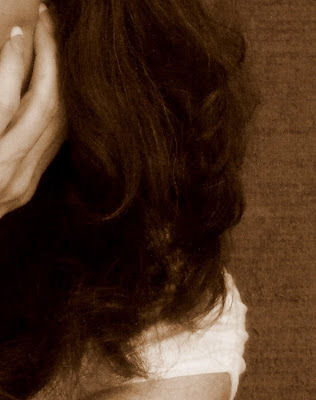 All I had was a strong unction to act, my pen, my words - and a blog. Soon my idea became a plan - a very simple plan. I wanted to know what would happen if all bloggers everywhere signed their name across an Earth globe and all posted the SAME POST on the SAME DAY. It was that simple. I would ask them to step out from huts and corners and cul-de-sacs for one day and write on the subject of peace. In their own language, from their own perspective, freely, in their own words. I would give them a common place to speak. We would have one twenty-four hour span of time to express our desire for a peaceful planet. A pledge. A signature. A symbolic promise. It was an invitation for all nationalities, creeds, tribes and religions to converge upon one page. Would it make an impact? I found a graphic and created the first one. 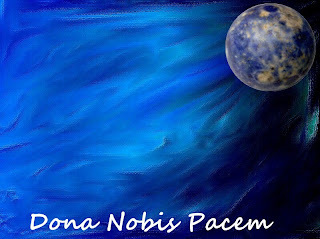 I asked bloggers to write "Dona nobis pacem" which is Latin for "Grant us peace" across the image and post it on their blogs in November - less than thirty days from the time I made that October challenge. 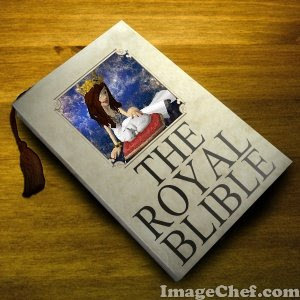 To my utter surprise fifty-two people responded enthusiastically and soon the idea began to spread. It was like watching the flames of a fire grow bigger and wilder by the day. I began to think of the possibilities. The fire in me was growing too. Soon part two of my simple plan came into view; we would visit each other in those far-flung neighborhoods on BlogBlast For Peace day and read what moves and motivates people thousands of miles away to follow the same idea. And in doing so we would learn what makes us the same. 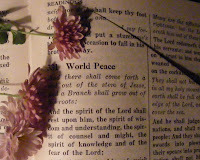 I no longer wondered would could happen on BlogBlast For Peace day. I knew what WOULD happen. Because the shift had already started in me. You know the one. The kind of intrinsic change that sneaks up on you. Mind-altering change, community birthing change, spine-tingling change. World changing change. 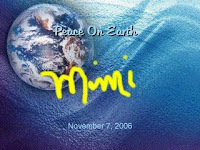 Some people said quite loudly under their breaths "Go on with your little peace experiment, Mimi. We'll play along." There's just one little problem with that theory. 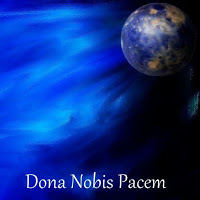 Before I knew it, Dona nobis pacem in the blogosphere began to take flight like a beautiful lyric in Blogland. I was so naive about the Internet in 2006 that the thought never crossed my mind to expect anything less than ALL blogs. There's just one little problem with that theory; there were approximately seventy million websites (!) and a new blog baby born every second. But that didn't matter to me. I thankfully didn't have enough doubt - or some would say enough sense - to let that temper my vision. Bloggers everywhere had just caught hold of the same vision. And besides, my burning desire to do something never went away. I have not changed that vision or that expectation, even to this day. From blog to blog it began to move, without promotion or money or advertising, entering one blog door and then another until it started to take hold and form something bigger than even I could envision. It became a virtual inscription of hope. Come November we were speechless. Scribbles and angst became poetry and art. Prose spilled into novellas of respect and controversy. Photographers set about finding perfect specimens to beautify with the lens. Blogs were dusted and the very best china set out. Comment boxes filled up with shalom and peace vibes, praise, encouragement - community. We were quite honestly moved. BlogBlast4Peace was the Internet's first ever online movement of its kind to invite bloggers to post the same message on the same day. I stand amazed to witness the creative passion displayed each year on pages across the world. Suddenly, nothing remained virtual to any of us. It was very real. And for me, nothing in my life was ever the same. Our visiting forged friendships and bonds that last to this day. There is something magical about the peace globes, something tangibly binding about this group. Something I can't explain. But every person who participates will tell you that very thing. Then one day someone called it a "movement." Indeed, it had become just that. What we have built since 2006 is a core of distinct and remarkable individuals called "peace bloggers." They write. They draw. They paint beautiful words and images. They help and encourage each other. They debate. They discuss. They banter about world and homeland issues. 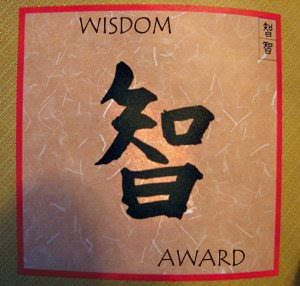 They may differ in philosophy and politics, but we try to find a way to peaceably debate. We invite other bloggers to join us. And then we sign our names to a promise. To a hope. To a dream we all have: to one day live in a world of peace. As the online scene changed, so did we. Not everyone had a traditional blog. No problem. We are now quite visible blogging peace on Facebook and Twitter. Even Pinterest. All are heard. All are documented. All have earned a special place in my heart. They continue to inspire me with their dedication to the peace globes, which now fly in 59 countries and countless provinces and cities across the world. They are housed in an online gallery here and shown daily throughout the year on thousands of blogs. Every November 4th - which is my grandfather's birthday - we fly them in unity. 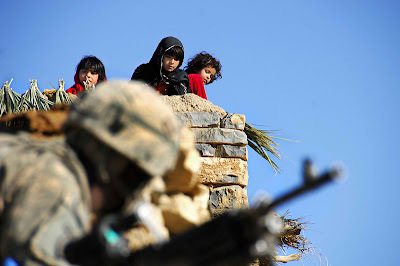 We launch a new BlogBlast For Peace. We hear new stories. 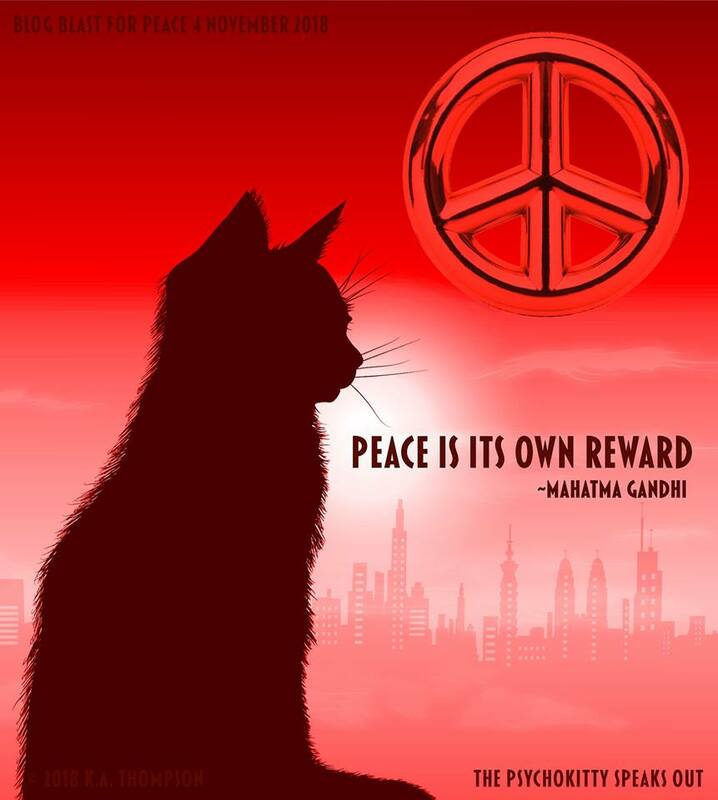 We welcome newbie peace bloggers. If they need help making graphics, peace globe "worker bees" step in to help. We learn about the world around us, how alike we all really are, and how incredible it feels not just to be a community of unified thought - but how powerfully freeing it is to be human in the presence of other humans. So. 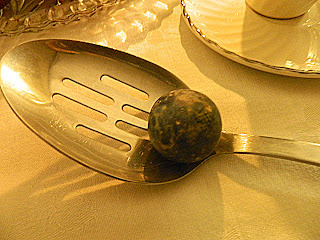 What's this about a marble? 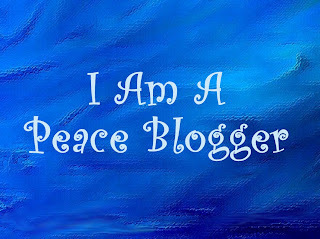 On the eve of the very first BlogBlast for Peace I was in my house preparing for the launch. There was a hush that night in the halls of Bloggingham Palace. Peace globes were pouring in from all over the world. I couldn't answer my emails fast enough. But a certain urgency permeated the rooms, too, and led me, at four hours 'til midnight to abandon my computer and take a walk. 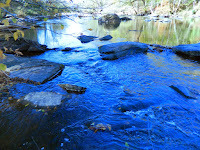 Oman, Greece, Canada, Louisiana, England, Australia.....peace blogging had begun on the other side of the world and I had no post of my own. How could this be? This man, my Papa, is the reason I hold tight to the peace globes. He was a walking living example of what it means to be peaceful. I went into my study. As I stared into the wooden bowl you see here that sits atop my piano, I saw something in the middle. You see it too, don't you? It was Papa's marble looking for all the world like our planet earth. A globe. Peace globes took on a deeper meaning and it nailed my purpose to the page. It was confirmation that not only was I on the right path - but that all along I had not been alone one second. Of course, Papa. What else could I write? He was the epitome of peace. 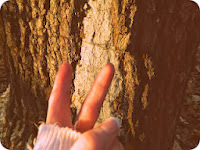 I went back to the table and began to write the story, my first peace post. I wonder if he knows what an inspiration he's become to so many... long after he left this world. I like to believe that he does. I wonder if he knew that his earth wrapped marble would become a symbol of peace and hope. He was that to me. And now he is that to you. 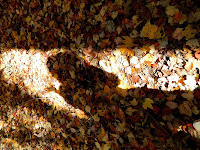 The Silence Of Peace BlogBlast For Peace #1 I used to say we were an invisible online world. I no longer believe that. 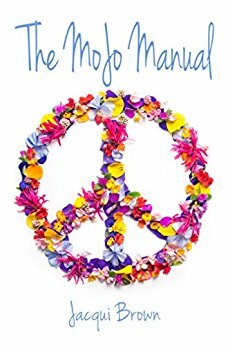 I've watched how the peace movement has deepened in meaning. Some of us stepped out of our computers and met in the real world. I've encountered tangible proof that the best things in life are intangible. Your words. On thousands of pages you've written your dreams and hopes. 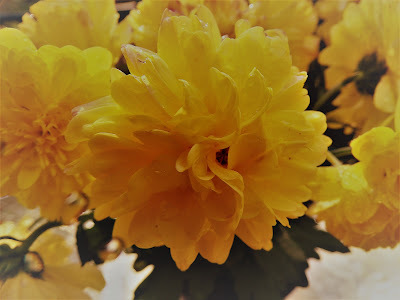 Each time someone blogs for peace, they send out a ripple of hope, of truth, of tolerance, that attaches itself to the next ripple and the next. Our pond is growing larger. But the premise remains simple and it is my job to see that it does. We simply blog peace. 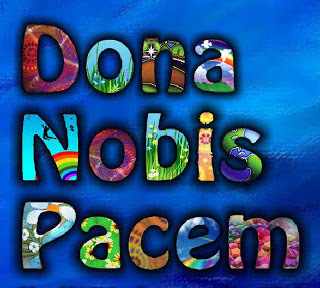 The world has to hear Dona nobis pacem...grant us peace. If enough of us say it, if enough of us believe it, if enough of us live it.....that has to be a positive force in the world. I believe in its power. Why? Because I believe in the inherent goodness of people, deep down, to do the right thing. If I didn't there would be no reason to hope for change. In our individual trials and collectively as humankind there has to be a spark of goodness in every soul. We were made for greatness. We won't get there without the goodness. I don't know what force led me to find a blue globe graphic and throw out a peace challenge. I don't know what manner of spirit or luck or destiny led me to my grandfather's old marbles that night. But there's a certain inexplicable electricity that accompanies faith fueled with the audacity to believe in something bigger than yourself. I had the faith. YOU had the audacity to accept my challenge. This movement has a power all its own. I respect that. 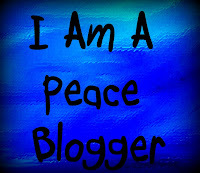 If you become a peace blogger, you will too. If words are powerful....then this matters. 1. Save and Sign. Choose any graphic on this page. Right click and Save. Decorate it or leave as is. Your peace globe and post will be assigned a number and placed in the Official Gallery at blogblastforpeace.com. By participating in Blog4Peace BlogBlast4Peace you agree that your peace globe and links may be displayed on other social sites such as Facebook, Twitter, Pinterest, Digg, wherever peace bloggers are online, and shared across the blogosphere in the name of peace and in the spirit of promoting this work. They may also be used in printed works and publications online and elsewhere by the founder of this movement in creating published works about the Blog4Peace movement. If you do not want your peace globe shared and made accessible to others, let me know. Otherwise, please understand that this movement is all about spreading the message. Thank you so much for organizing this and holding it every year. We can wish, hope, and pray for world peace.